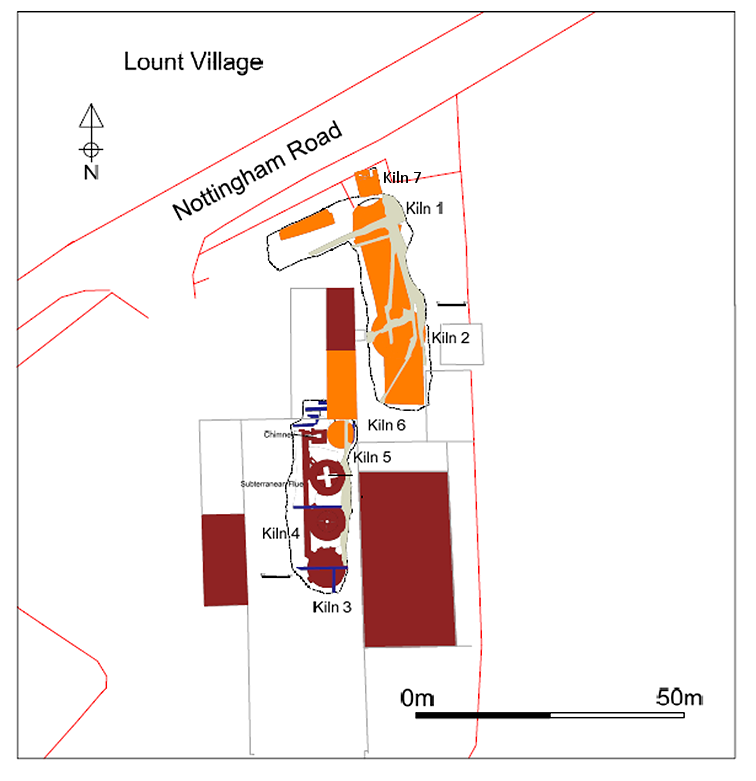 Monitoring of the clearance of the former Coleorton Pottery site at Lount in north-west Leicestershire in 2012 has given ULAS archaeologists a rare opportunity to excavate a series of 19th and early 20th century kilns in the county, which has far fewer recorded potteries than Staffordshire or Derbyshire. Kilns 1 and 2, two updraft kilns connected by a central workshop; thought to be the earliest structures on the site. Image credit: Aerial-Cam. Plan of the principle structures on the site: pre-1880s (yellow) and post-1880s (red). The Coleorton Pottery was established in 1836 by Sir George Howland Willoughby Beaumont of Coleorton Hall and by 1842 it was known as the Wilson and Proudman Pottery, with Thomas and John Wilson, and George Proudman listed as pot makers. 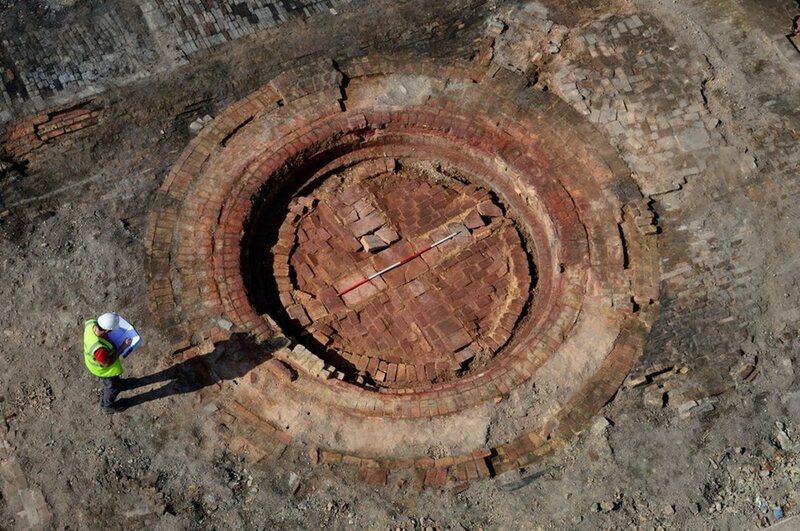 The earliest structures appear to have been two large circular kilns (1 & 2) separated by a workshop at the northern end of the site close to the Nottingham Road. These were downdraft kilns, each contained within its own hovel, or bottle-shaped chimney. A third rectangular kiln (7) possibly the remains of a muffle furnace, used for high-temperature applications such as enamel coating, was found nearby and by the 1880s a fourth kiln (6) and more workshops had been added to the site. No evidence was found to suggest this kiln was ever fired, however, and it may have been adapted to serve as a hot house, store or production room. By the 1870s the pottery was trading under ‘Wilson Brothers’ and the 1881 census lists William Wilson, probably an heir of either Thomas or John Wilson, as an earthenware master employing ‘17 men, 11 young women and 3 boys at the Potworks, Cole Orton’. Subsequently it passed through a succession of different owners. Kiln 4, one of the downdraft kilns built on the site by 1903. Image credit: Aerial-Cam. In the late 19th century or early 20th century, the pottery underwent a radical redevelopment and expansion. By 1903, two new kilns (3 & 4) had been built to the south of the original pottery buildings, with a third (5) added before 1923. These were all downdraft kilns, connected by a large subterranean flue to a tall exhaust chimney. Despite its comparatively moderate size, Coleorton was a significant manufacturer of yellow wares and Rockingham ware during the 19th century. Census returns suggest that the pottery was at its peak between 1851 and 1881, listing brick makers and pipe makers as well as pot makers, indicating diversity and overlapping trades within the pottery. In the late 1890s, the factory moved into producing ‘art pottery’, expanding its range in the 20th century to include gas mantles and electrical insulators until it closed, after 100 years of production, in 1938. Coleorton Pottery in the early 20th century (looking west from the Nottingham Road). Beehive-shaped kilns 1 and 2 or visible in the foreground with the chimney for kilns 3-5 behind. 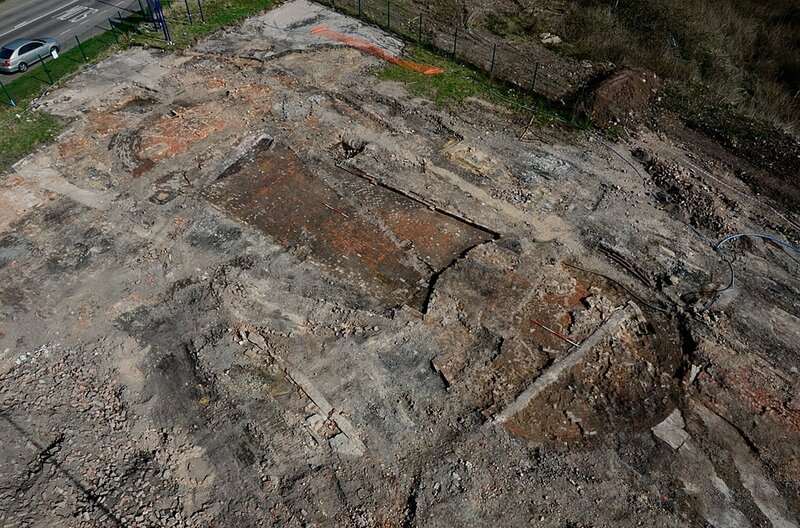 ULAS would like to thank Bellway Homes (East Midlands) Ltd., who financed the project, and David Barker, John MacDonald, David Ash and Samuel T. Stewart for their invaluable knowledge of Coleorton Pottery and the regions post-medieval pottery industry.